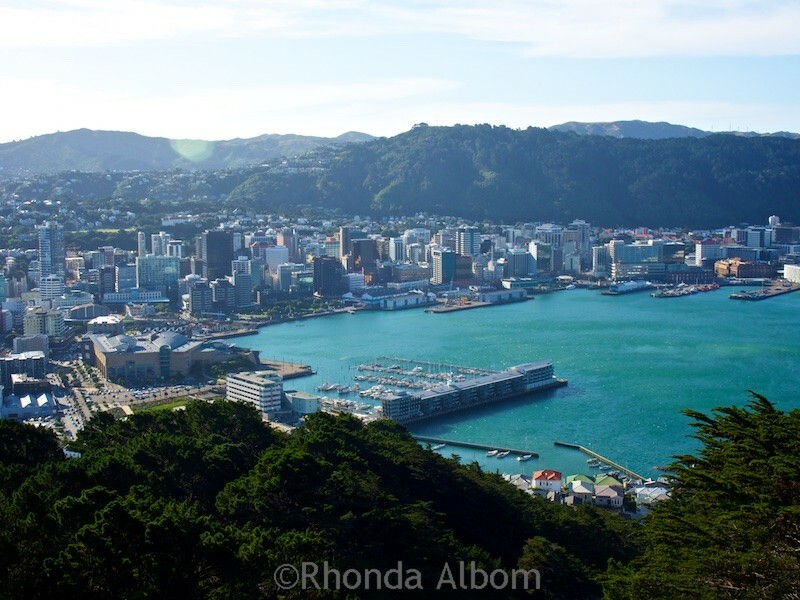 Hiking Mount Victory, we were immediately rewarded with 360-degree views of Wellington’s eastern harbour bays, Wellington airport, the Hutt Valley, local Island, and the Miramar Peninsula. The views are well worth the effort to get here. In reality, “hiking” Mount Victoria is probably a bit of an exaggeration. It’s more of a moderate uphill 2-kilometre walk, sometimes through on a dirt path, other times on the public road. 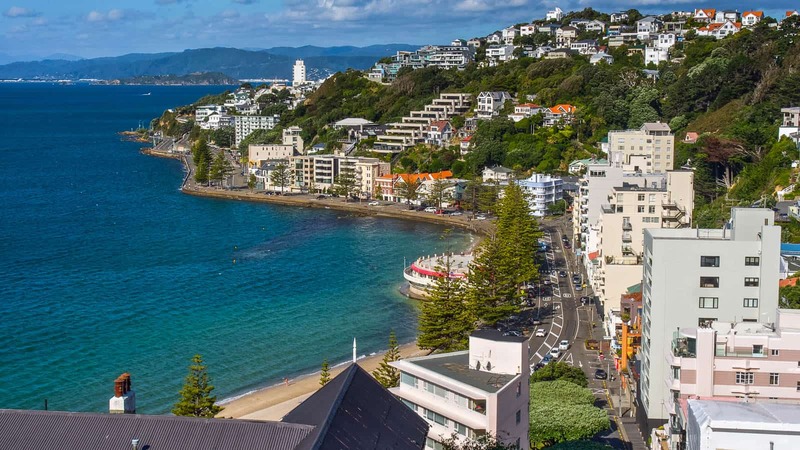 It’s one of the top things to do in Wellington, one of my favourite New Zealand cities. 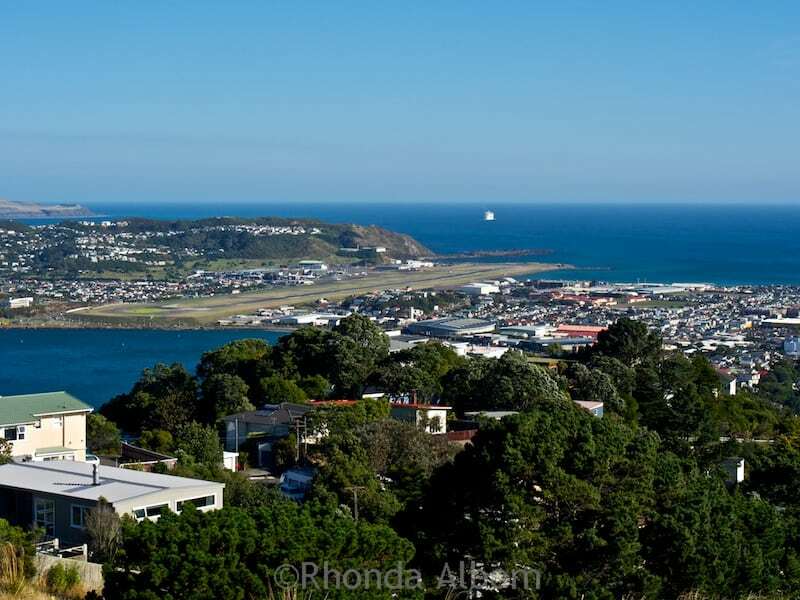 At 196 metres, the Mount Victoria lookout is taller than any natural point in Auckland. There are several paths to get to the top, some quicker, while others are longer but with better views. We were later told we had selected the most difficult path for hiking Mount Victoria. According to my Fitbit, we climbed the equivalent of 107 flights of stairs (some of it was actual stairs). Our first amazing view on the way to the top. Part of our walking trail. View from the top including the airport. 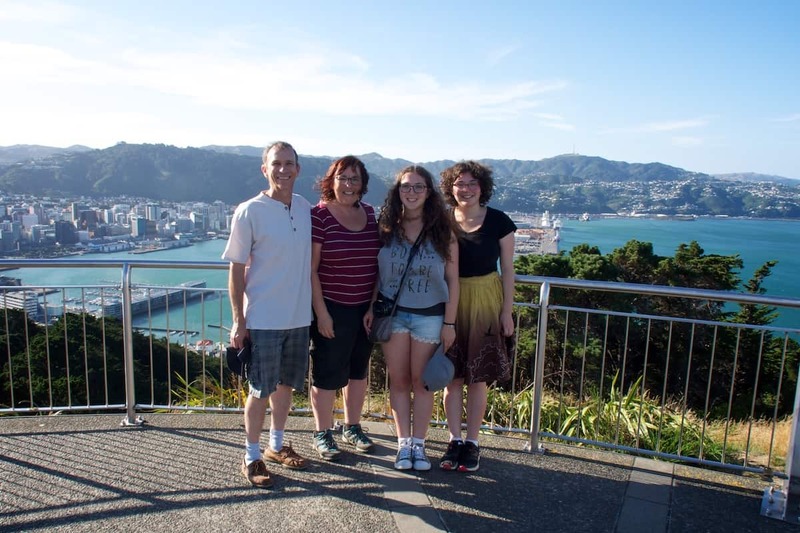 A family photo after hiking Mount Victoria. If you look at my hair you can get an idea as why the city is nicknamed “Windy Wellington”. Another view from the top – by now, hiking Mount Victoria seems like a great idea – although, we still have to go back down. The streets at the foothill were pretty steep too. Walk, stroll, hike, jog, drive, or take the bus. The choice is yours, but do get to the Mount Victoria Lookout if you are in Wellington New Zealand. We opted to hike to the top. Walking is easy, and the main path is signposted. Just when you think you are exhausted, and can’t take another step, a jogger will breeze by as if it were flat. From Oriental Parade it took us about 90 minutes to reach the summit. We must have been walking shockingly slow, as most walkers can do it in an hour (about a 30-minute walk from the city to the base of the hill, and another 30 to the top). There is plenty of free parking at the top, should you be in Wellington with a car. Unless we have driven down from Auckland, we rarely have a car when we visit Wellington. It’s an easy city to get around on foot, and parking is expensive in most places, albeit free at Mount Victoria Lookout. If, however, you do want a car, we use and recommend RentalCars.com. To date, we have had only positive experiences with them. If you don’t want to drive or walk, the number 20 bus will take you to the top. 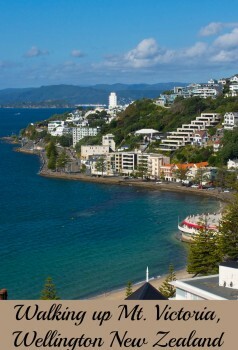 Or, if you want to include it in a bigger day, Mount Victoria lookout is a stop on the Wellington Hop-on-Hop-off bus. It can be quite windy at the top. 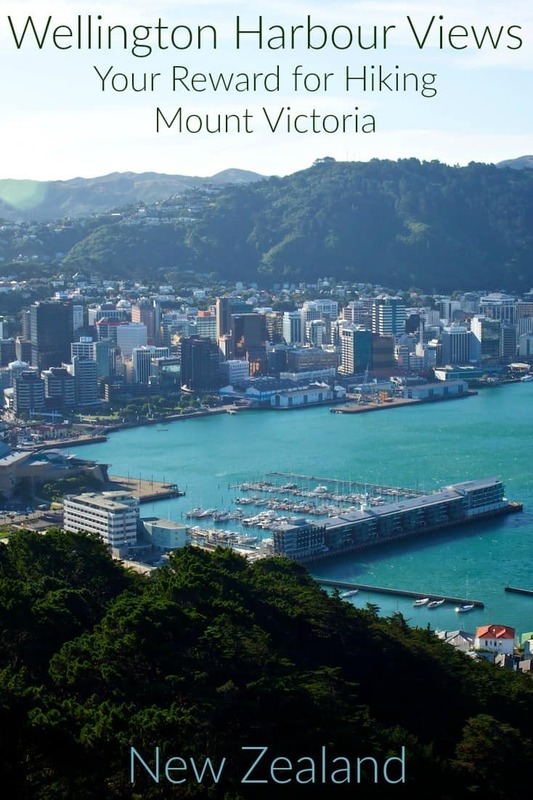 There is a reason for the city’s nickname, Windy Wellington. A moderate level of fitness is recommended if you are going to walk. The summit is a great place to see sunrise or sunset. The Lord of the Rings fans will want to know that part of Mount Victoria served as the outskirts of the Shire during filming. 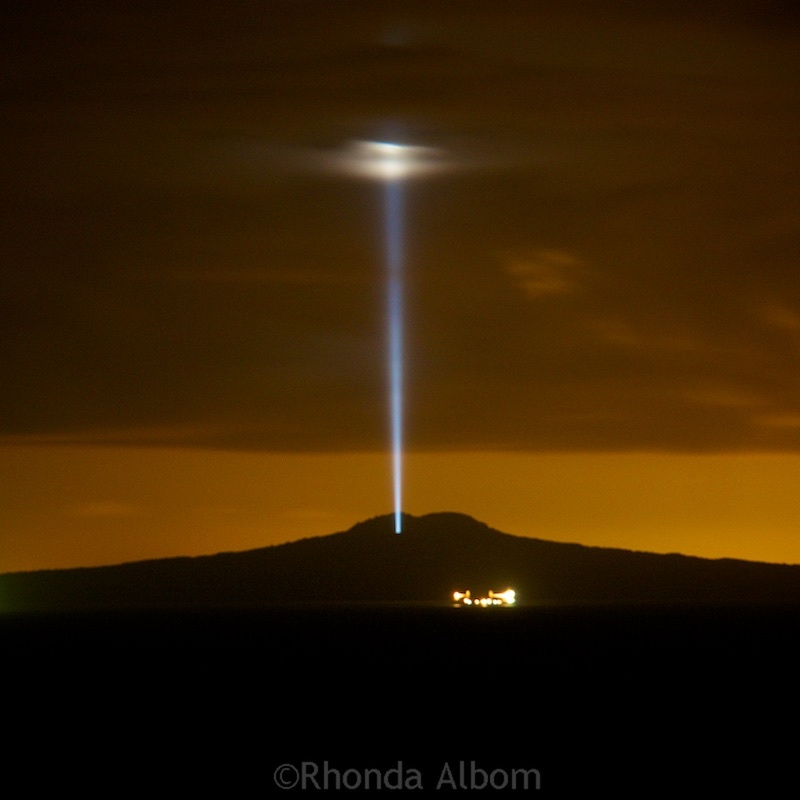 There is also a Mount Victoria in Devonport. If in a hurry Auckland is an all day dive from Wellington. 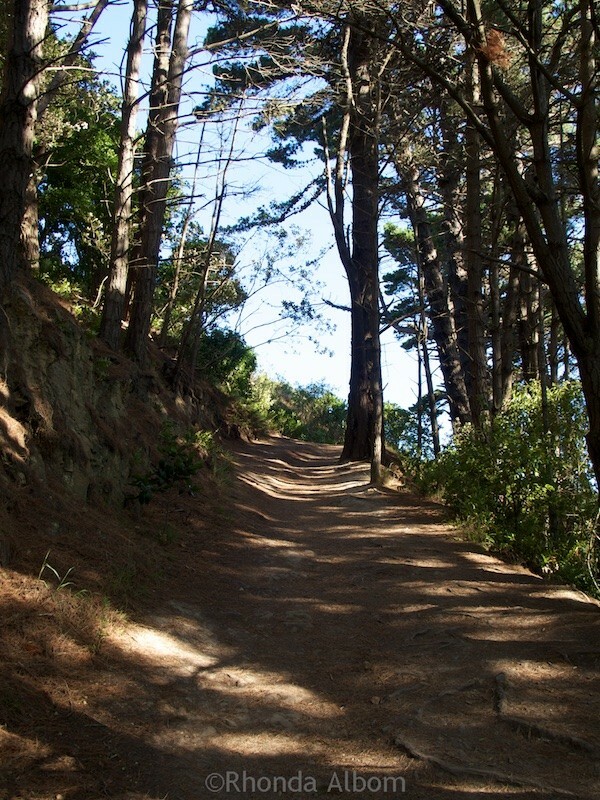 Does hiking Mount Victoria appeal to you, or would you take the bus? 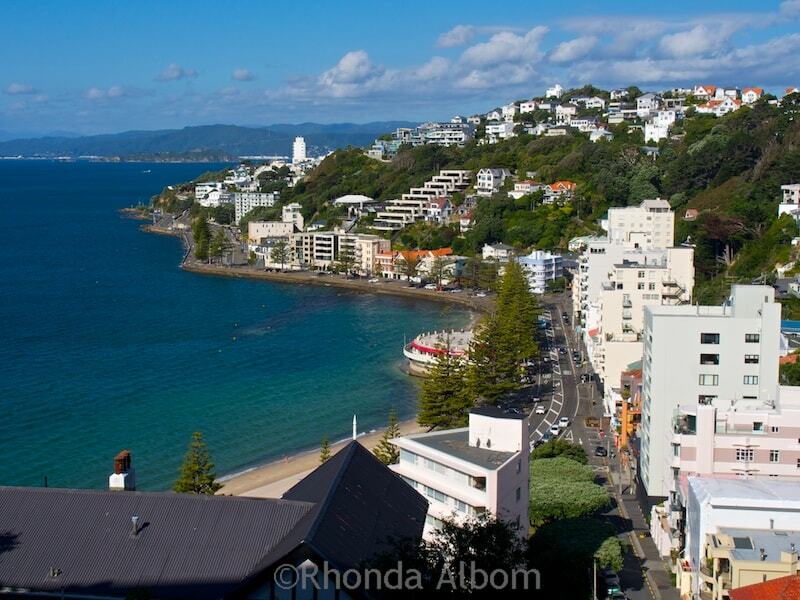 Have you been to Wellington? I miss hiking! Here in south Mississippi, we don’t really have a lot of hills. When I lived in Louisville, KY, I was hiking several times a week. Loved it! Thanks for sharing with us at Photo Friday! What a wonderful family activity and I would definitely say well worth the 107 flights of stairs! The view from Mount Wellington are sensational. My daughter always makes we hike up Mount Coolum on the Sunshine Coast, where she lives each time I visit her. It almost kills me!! It was the equivalent of 107 flights, not actual stairs. We almost moved to Mooloolaba a few years ago. If we ever get back, Mount Coolum will be on our list. I wish your daughter the very best in Argentina. David and I love Argentina, not just Buenos Aires, which is magical but Cordoba, San Miguel de Tucuman and Salta. It is a beautiful country with beautiful people. Will your daughter be studying in Buenos Aires? If she is, tell her to make sure she takes the ferry across to Colonia del Sacramento in Uruguay for a day or a weekend. It is a magical place. I have done a post on it which I am sure you can find on my blog. If not, message me and I will send you the link. We also did a road trip from Cordoba to Tucuman a few years ago. I ‘m quite envious. If Buenos Aires wasn’t so far D and I would pop across for lunch every second weekend. WoW! Sounds like it was good exercise and the view was great! Great exercise and you get the gift at the top that is the fantastic view! You are a real little fitness junkie now. You have done so well. Lovely family shot. LOL – not quite a fitness junkie, but I do make better choices. Love the pic with the stairs and the hiking trail. Some hiking you did! I have been with Weekend Travel Inspiration for about a year (I think). I know it will all be good, it’s just the transition right now, both girls at once that seems a bit overwhelming. To be perfectly honest, I would take the bus to the top. It’s just a bit much for me. I can hike a bit on level ground but 107 flights of stairs? Not with my heart. I’m willing but the flesh is weak. That is a very memorable activity for you to share before your nest empties out. LOL – I am pretty sure one of our girls would have joined you. It was hiking trails, equivalent to 107 flights. Looks like a perfect hike! Fabulous views from the top! Surprisingly stunning views – although I don’t know why I was so surprised. Sign me up! What a great way to spend your last week before the girls set off on some amazing adventures on their own! I agree, it was a perfect last family holiday together. Looks like a great walk. I’ve never hiked up there when I’ve been to Welly. Looking at your pics makes me wish I had. I hadn’t been up there at all before, but now it will be on my itinerary for every visit. Hi Rhonda – I can imagine what’s happening to you all right now – lots of emotions … but lots of opportunity for the family … such fun to be around with you all – good luck with the preparations as those count downs come around. Yes, we are an emotional roller coaster family right now. Looks like a great hike. Congrats to both your girls! I hope Sarah keeps those photos coming from Argentina! Sarah promises to post on some of the Sundays. Hopefully she will. I didn’t walk 107 flights, but rather the uphill elevation equivalent of that. The volcanos are like that. However, if you visited 30 crypts each with 5 up and 3 down, then return, you did way more steps than I did. Why the eye rolling. I’d hike with you. The short answer: Teens. (Well just one of them would rather take the bus). And I hope we get to hiking together soon. Agreed, I had no idea it was going to be this amazing, or I would have done it on an earlier visit. Looks like a perfect hike after a wholesome weekend brunch! I think we skipped the wholesome brunch, but the hike was great. Hiking Mount Victoria sounds great to me! With such phenomenal views at the top, I wouldn’t want to miss it. 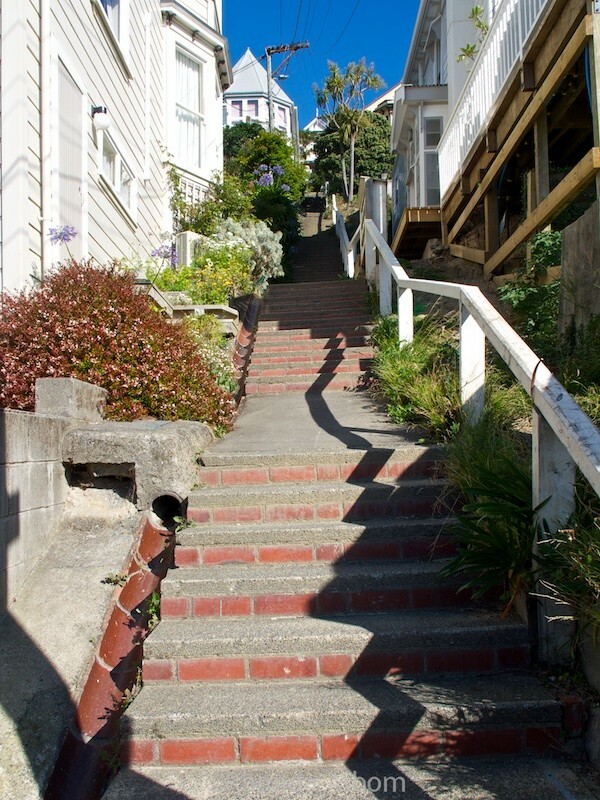 Hiking and a million stairs – LOL! But what a grand time for your last family outing for a while. We used to hike a lot around the Sandias outside of Albuquerque, NM when we lived there. Not quite a million – lol. The fitbit counts the elevation change (uphill only). I don’t think we walked on any actual stairs. – I love New Mexico. Glad your family got to have one last adventure together before the girls take off. And since I’ve followed you for several years, I can now see how much both of your daughters have grown. It seems like just yesterday they were babies, now they are going out in the world – hopefully well prepared for whatever lies ahead. 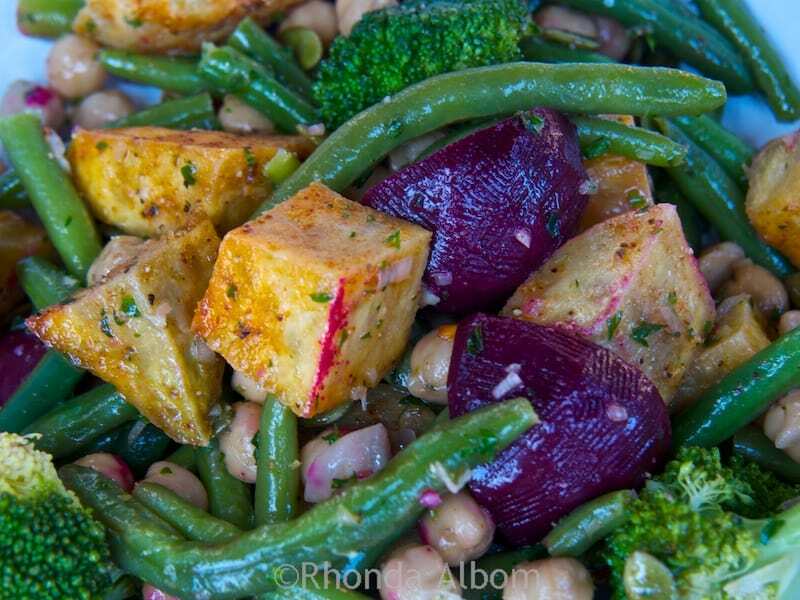 Ah, this is stunningly beautiful, Rhonda. Hiking in a place like this is my ideal way of seeing it. I’d rather do that than take the bus. What a glorious view you had from up there! So true, it was the journey as much as the destination, although parts were a bit steeper than I prefer. I’d do the hike rather than taking the bus. What views. I didn’t think about the bus for too long, before we decided to hike it. Beautiful photos! And good luck to your girls on their upcoming adventures. My 3, all grown, live all over the US and now one is moving to Korea – and while it’s so difficult to be far away from them it has made for some fun travels to see them! Thanks. They sure have big adventures lurking.